A Façade is not only the visible front of material things; it can also be an invisible wall somebody puts up to protect, pretend or hide behind. Kruithof’s Façade, a photographic sculpture, explores the fragmented and refracted psycho-social state of contemporary New York. 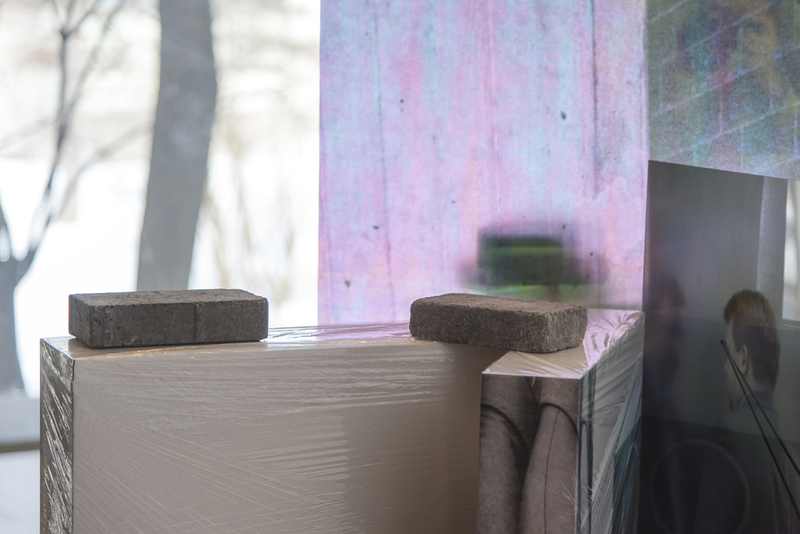 Simultaneously enamored with and skeptical of the medium of photography, she re-situates the picture plane onto construction materials – combining photo-stickers, bricks and polystyrene blocks, as well as inkjet prints that sit on radiant and clear Plexiglas. There are images of a shadow of an undefined figure on a brick wall, a back of a man, hands holding a device, part of a recording studio. 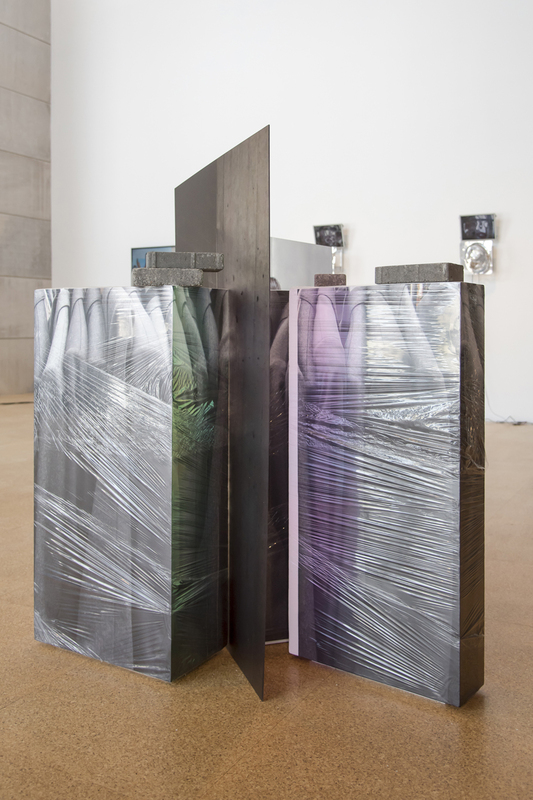 The large photographs of racks of suits or men of Wall Street reify as packaged building blocks due the way Kruithof wraps the large photo stickers around the polystyrene blocks with cellophane foil. The multi-layered sculpture with shifting views of color and content challenges the viewer’s search for a definitive perspective. 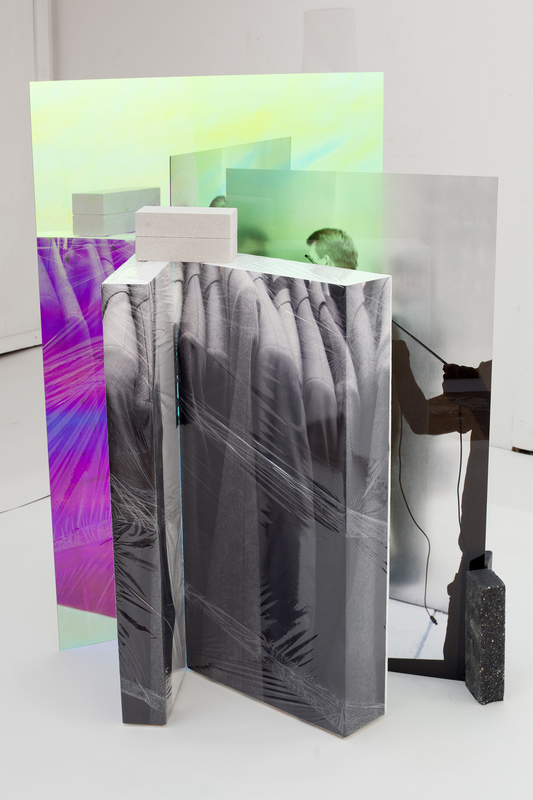 Even if the iridescent reflections enliven the otherwise bleak black and white world of corporate America, it’s hard to fathom the anonymity of the image language within this sculpture. Kruithof invites to reflect on the paradigm of every-day business life, but also searches for the moment in which façades begin to crack.